The Lenovo Smart Tab is a great 10.1” Android tablet that becomes a Smart Screen with Amazon Alexa. 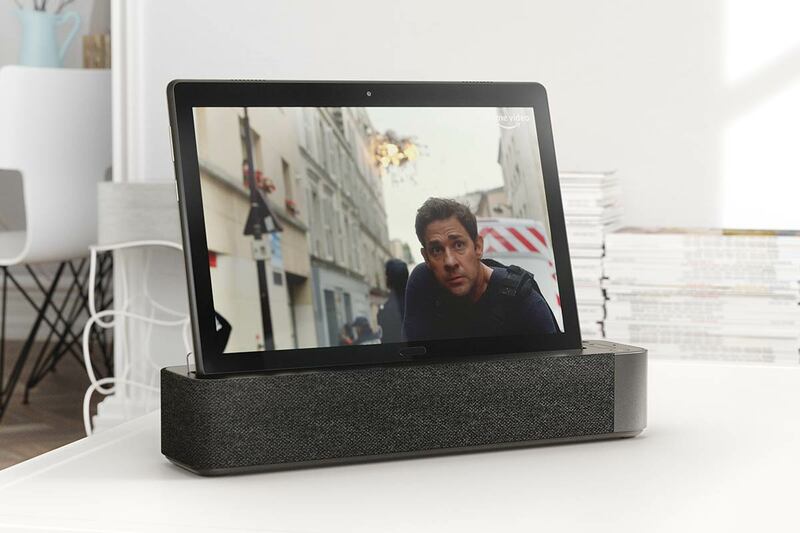 Dock it and ask Alexa questions, see your calendar, play videos on its beautiful 10.1” FHD display, and enjoy music with loud, crisp sound. 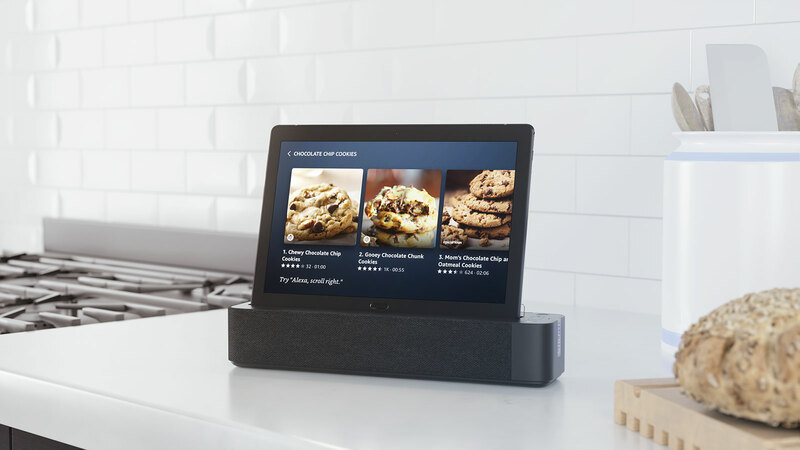 You can also get news, see sports scores, and even, thanks to far-field voice pickup, control your home from across the room. All hands‑free—just ask. Stream music from Spotify, Pandora, TuneIn, or iHeartRadio. Or sing along with the lyrics on Amazon Music. All quickly, easily, and hands‑free, too. 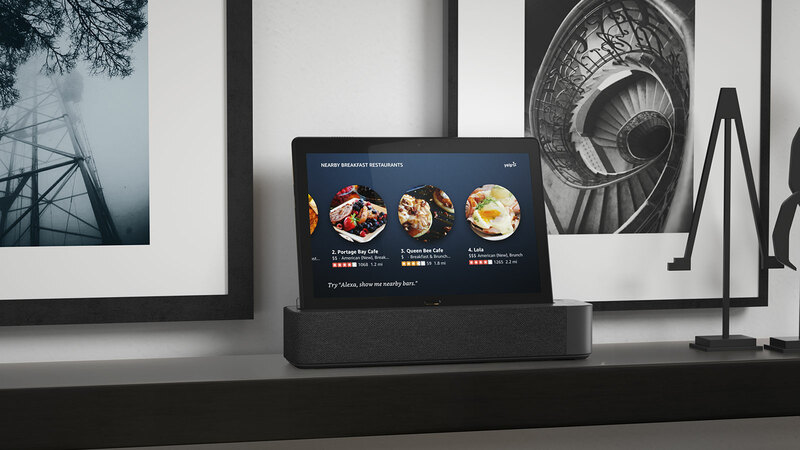 Whatever you ask Alexa to play, you’ll enjoy a room full of clear, clean sound from your Smart Dock. 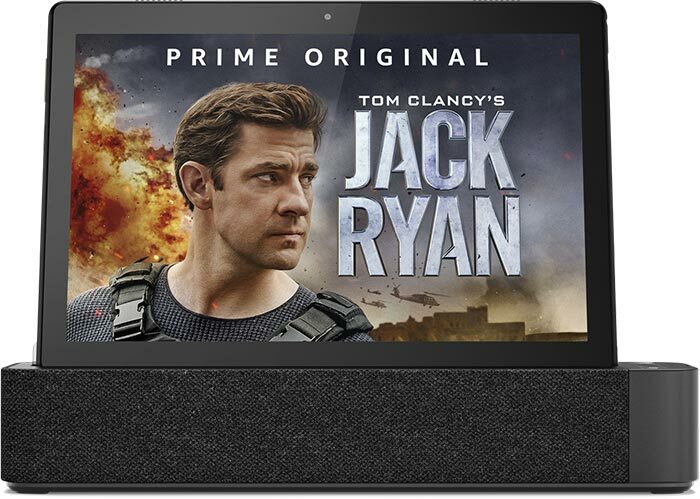 "Alexa, play Tom Clancy’s Jack Ryan." 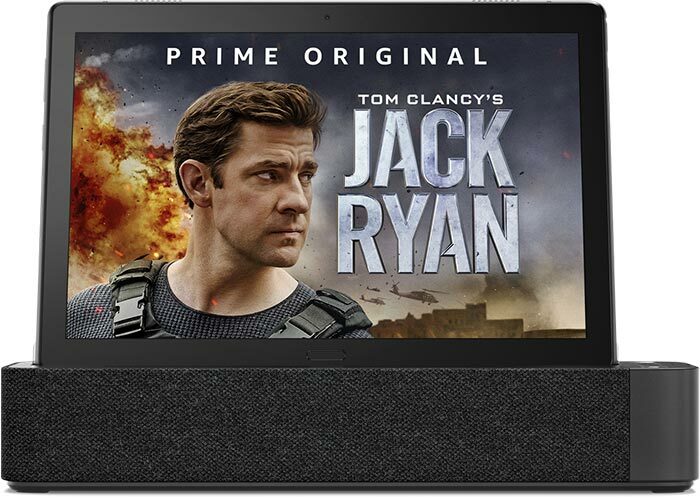 Say “Alexa, play Tom Clancy’s Jack Ryan,” ”Alexa, show me popular movie trailers,” or “Alexa, launch YouTube,” to enjoy the entertainment you love hands‑free. 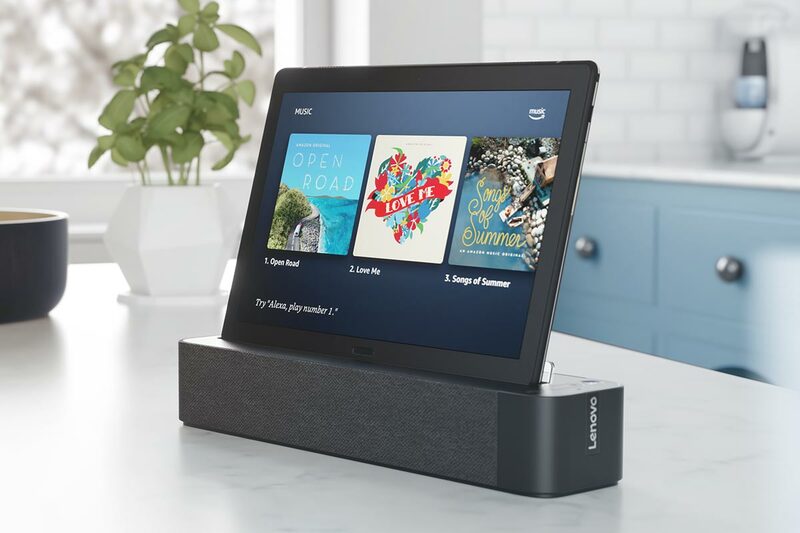 Tuned by Dolby for clarity and power, the Lenovo Smart Dock's pair of powerful speakers deliver rich, pure sound, front and back. 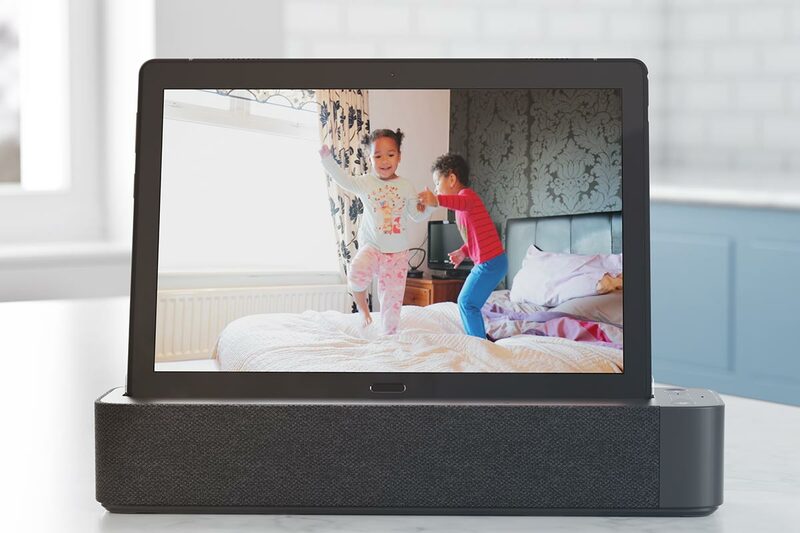 With room‑filling audio that will engulf any space in your home, you can enjoy your favorite beats and videos—even from afar. With compatible smart home devices like Ecobee, Philips Hue, and WeMo, see who’s at the front door, turn off the lights, adjust the room temperature, and more—without leaving your chair. All you need to do is ask Alexa. With Alexa built in, it’s easy to check the weather, see the news, set a timer, or get an answer to a burning question. Three far‑field microphones pick up your voice, enabling you to enjoy hands‑free help, anytime. Undock your tablet and take it everywhere you go. Primed for entertainment, it boasts a brilliant 10” FHD glass display and booming Dolby Atmos® sound. No thicker nor heavier than a glossy magazine, this stylish device is the perfect travel companion. Share your tablet with the family. With dedicated user profiles, everything’s saved and managed separately. So everyone can enjoy their own apps, wallpapers, settings, and files. Plus, with the built‑in Kids Mode supported by KIDOZ, your young ones can watch safe, curated, preloaded content—and you enjoy peace of mind. 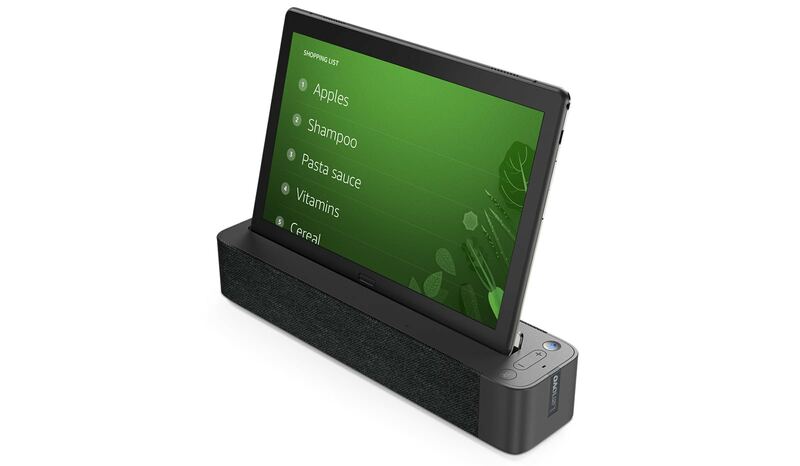 What tablets are compatible with the Lenovo Smart Dock? 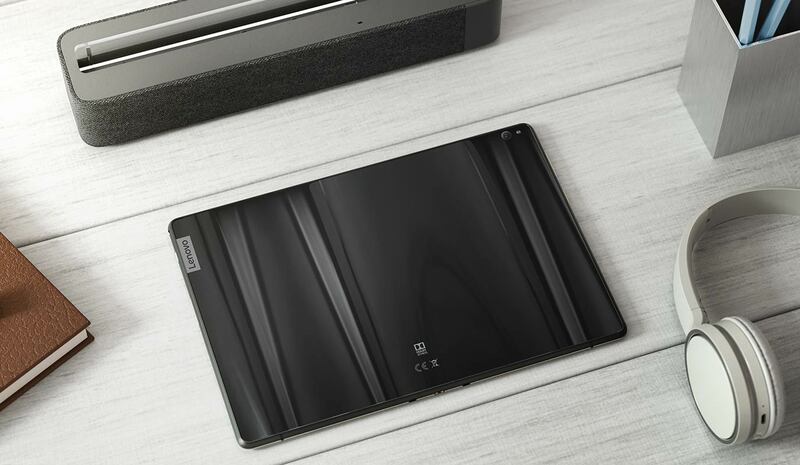 Only Lenovo Smart Tab M10, Smart Tab P10, Tab M10 and Tab P10 models are compatible. Models available in select countries. 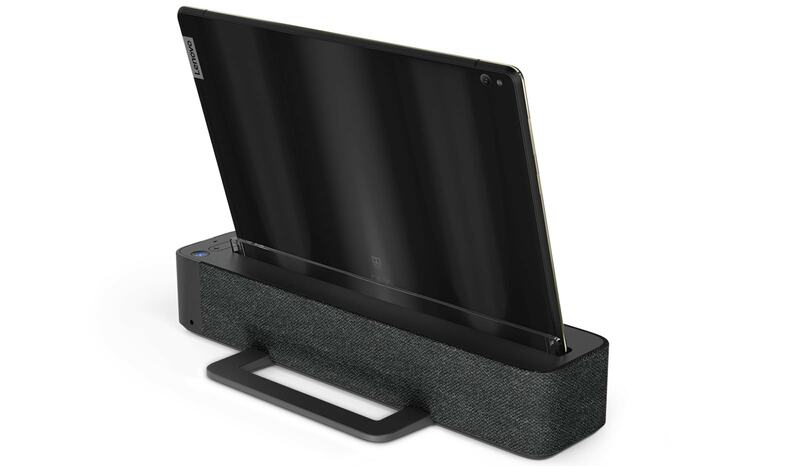 Does the Lenovo Smart Dock charge the tablet? Yes, when the Smart Tab is docked into the Smart Dock it will begin charging. Can I pair my phone with the Smart Dock and play audio from it? 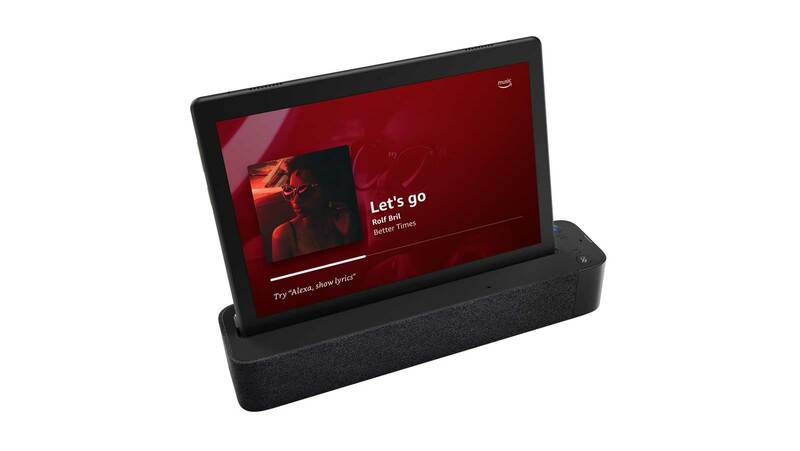 Yes, after pairing the Lenovo Smart Tab with the Smart dock the first time and signing into your Amazon account, you will be able to pair other external Bluetooth products with the Smart Dock and use it as a Bluetooth speaker. Do I need an Amazon account to use Alexa features? Yes, you need to have an Amazon account and be signed into the Alexa app on the tablet to use Show Mode. Does the Lenovo Smart Dock come with batteries? No, the Lenovo Smart Dock does not have built-in batteries and has to be plugged into an outlet at all times to function. Is there a way to mute the dock’s microphone from always listening? 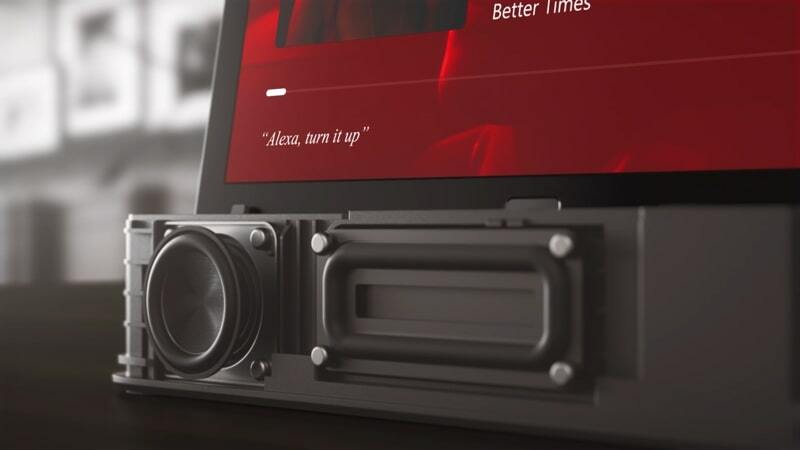 Yes, there is a physical mute button on the Lenovo Smart Dock, which prevents Alexa from listening. Is Alexa recording all my conversations? No. Alexa is designed to record only what comes shortly after the wake word (“Alexa”). 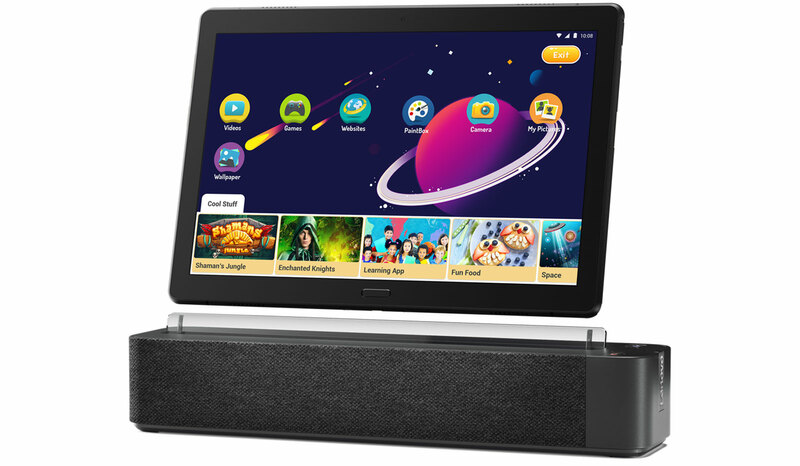 No audio is stored or sent to the cloud unless the Lenovo Smart Tab is triggered by the wake word. Can I buy just the dock on its own? 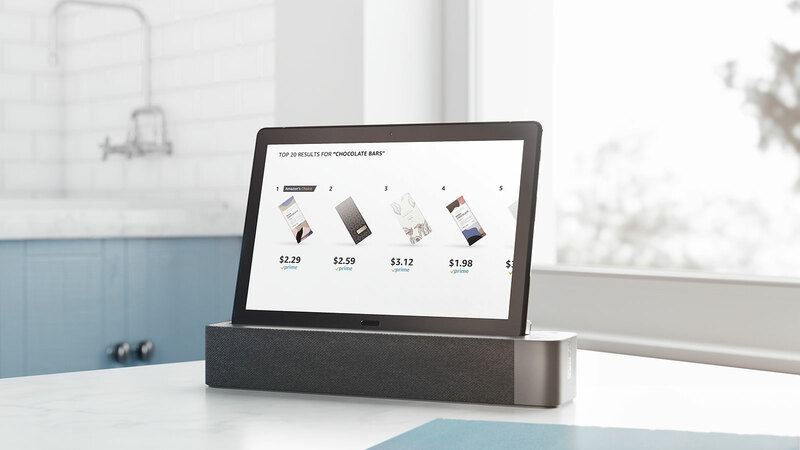 The Smart Dock may be available to buy separately in select countries. Check your local Lenovo.com website to find out more. Can I use Show Mode without docking the Tab M10/P10 into the Lenovo Smart Dock? Yes, you can toggle to Show Mode in the Android drop down menu. From how far away can I speak to the Smart Tab when docked? It depends on the volume of your voice, background noise, and volume setting. 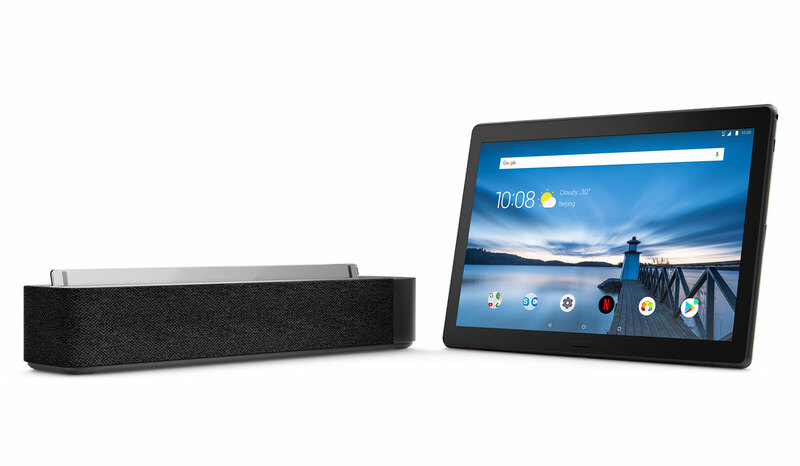 Your Lenovo Smart Tab should be able to hear you from across a large living room. I have multiple Alexa products in my home. 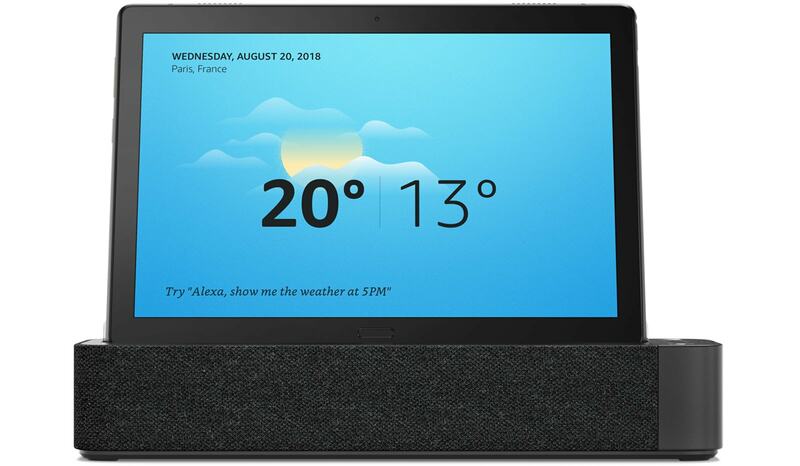 Will the Smart Tab work like other Amazon Echo products and only the closest to my voice will respond? Yes, the Lenovo Smart Tab, when in show mode, will act as other Amazon products and will wake depending on proximity of the voice command. Can different people in a household issue voice commands to Alexa when in Show Mode? Can it be linked to multiple Amazon accounts? Yes, different people at home can issue voice commands, ask questions, play content and control smart home devices, but only one primary account can be linked to the Alexa app at one time. The main account controls the default language, shopping cart and taps into that user’s schedule and preferences. Technical support is available during the lifetime of a product at: https://support.lenovo.com. Ask Alexa for your favorite movies and TV shows hands-free. 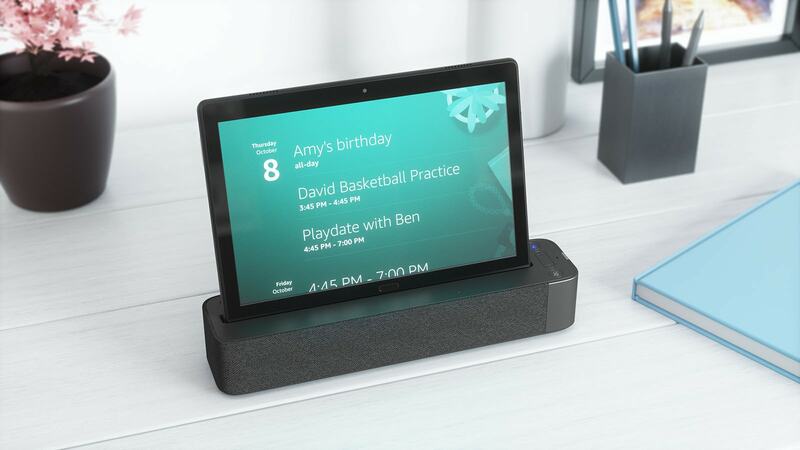 A premium Android tablet to go; an Alexa Smartscreen when docked. The First 2-In-1 Tablet with Alexa that boasts premium Dolby Sound. 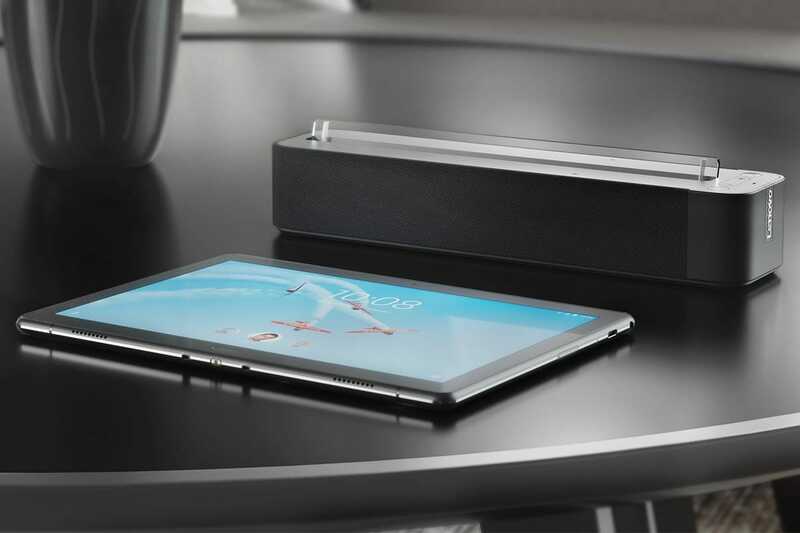 Take advantage of the Lenovo Smart Tab hands-free controls. Amazon, Alexa and all related logos are trademarks of Amazon.com, Inc. or its affiliates.